Authenticity is very important to me,” says Anupa Mueller. I’m speaking with the owner of Eco-Prima Tea and Silver Tips Tearoom in Tarrytown, New York, over the phone, and it’s early evening on her end—time for some Darjeeling. Anupa isn’t talking about authentic tea. Well, not exactly. 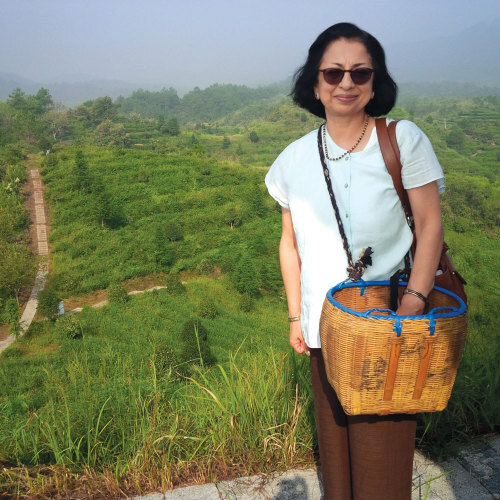 Eco-Prima deals in many organic and Fair Trade teas, and as the US ambassador for her family’s tea estate in Darjeeling Anupa connects the US to one of the world’s leading biodynamic farms. Authentic cultivation at origin matters to her. Instead, she’s referring to being herself. In 1995, after much success in the corporate world, Anupa decided to walk away. “Really living your life,” she says, “showing compassion, showing kindness, and doing the right thing—I didn’t want to do it in my spare time. I wanted to breathe that into my companies.” Guided by a desire for more meaningful work and the freedom to be herself, she began down a new path, working with what she knew best: tea. Growing up, Anupa’s family had familiar tea traditions, as many do in eastern India. But it wasn’t sweetened chai or robust Assam. It was always Darjeeling, steeped in a teapot, served family-style. Her senses then and her senses now sing at the region’s distinct terroir. (Though she steeps whites and greens for herself in other parts of the day, in early evening Darjeeling is still her go-to.) From the beginning, her journey seemed written in the leaves grown so near her childhood home. When her sister married Rajah Banerjee, the fourth-generation tea grower of Darjeeling’s Makaibari Tea Estates, tea was further cemented to Anupa’s future. Makaibari is revered for its first flush teas, infamous for its record-breaking auction prices, and well known for its pioneering work in biodynamism. Makaibari was the first estate to be certified Fair Trade and the first estate in Darjeeling to be certified organic. The estate’s teas are celebrated around the world. To reach eager American consumers, those teas go through Anupa and Eco-Prima. As family, Anupa gets first refusal on highly coveted lots. Beyond Makaibari, she sources quality teas from around the world, making regular excursions to China and India. Her wholesale clients receive those precious leaves along with her extensive knowledge, which she also shares with customers at her tearoom in Tarrytown, a village on the Hudson River. She is known across the industry for her fair-minded approach to tea. Her perspective, always non-judgmental, opens tea up to the masses. Even in hiring for her tearoom she doesn’t always look for experience, instead employing those with a willingness to learn. She purposefully sought out many of her first employees through the local YWCA, wanting to create employment for those who needed it most. By keeping her businesses rooted in principles that she believes in—like compassion and authenticity—she long ago left behind the dualism of her past careers. 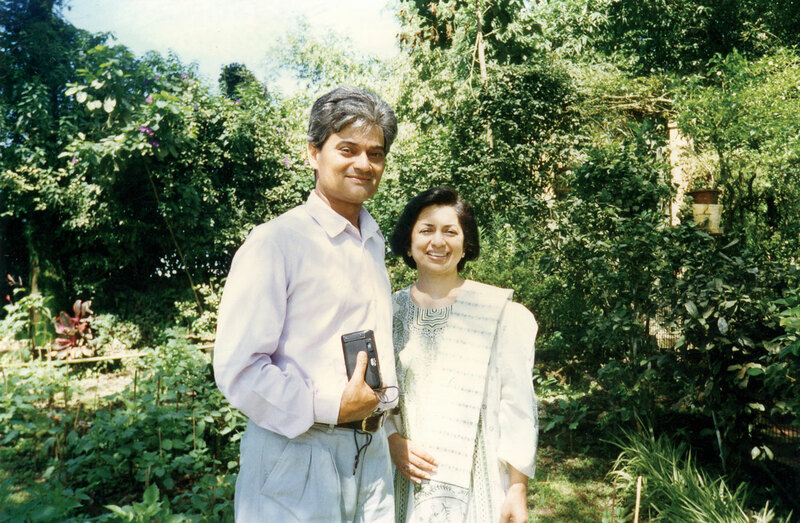 Anupa with her brother-in-law Rajah Banjeree, owner of Makaibari Estate. Anupa’s excitement is contagious, even speaking to her over the phone, her enthusiasm for what she does is cheering. 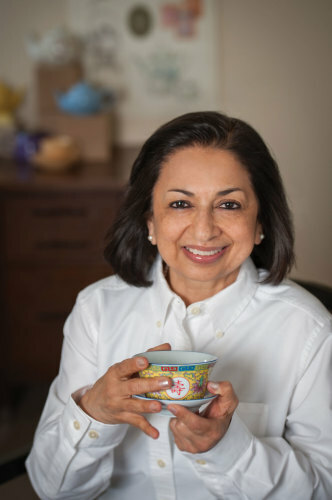 “She has always been a people person and has an amazing way of expressing her thoughts and putting forward her view point,” says Devan Shah, CEO of International Tea Importers and another one of the industry’s respected tea educators. Seth Goldman, co-founder of Honest Teas, describes Anupa as “a fount of enthusiasm, passion, and commitment to promoting a healthier, greener, and more responsible tea supply chain.” Many speak of her as a friend and an expert; just the person you want to introduce you to the world’s best teas. I spoke to Anupa at length about her tea roots, how the tea industry has evolved, and her goals for continuing to spread the good word of tea. The interview has been edited for length and clarity. What was your first exposure to tea? When you go to school in Darjeeling, you have no option but to be surrounded by tea. Because the moment you land at the airport and you get into these Land Rovers and Jeeps to go to your boarding school, you pass right through tea fields. We sort of knew about tea even when we were not thinking about tea because we were surrounded by tea. And as people here go to museums and parks and other places for their field trips, obviously we went to tea estates for ours. When we finished school and we left we said we’d never go back: we wanted to get away from Darjeeling. So imagine my surprise when my sister married Rajah Banerjee, the fourth-generation owner of Makaibari. What lead you to work in tea? I came to the US, went to graduate school, got my MBA, moved from the United Nations to a huge multi-national Fortune 500 company, got my marketing training, managed many products and services. At about the ten-year mark I thought to myself, “Oh my goodness, if I don’t do something else I can see that I will never get out of here.” I really wanted to follow my own vision rather than somebody else’s vision. And when I looked at my skill set and what I knew, the only thing that I knew well enough to do business in, that I truly felt comfortable doing, that I knew a lot about the supply, I knew the growth, I could understand how it originated, what one does with it, was tea. And I was very fortunate that this was 1995 and in the early stages of organic. Nobody knew about Fair Trade. Makaibari was the first tea estate in the world to become Fair Trade so I had that as a selling point. But of course I didn’t know at that point that any of these were selling points. I was only focused on this magnificent estate and that fact that it was tea and it was wonderful and marvelous and I knew how to market something. When did you expand beyond Makaibari? It took me about a year to really try to market just Makaibari. My first customer was Granum, called Choice Organic Teas now. They already were buying Makaibari, they were one of the early organic pioneers in the US, and we knew them and I was given their account as the first to shepherd and see if I could bring it to fruition. And I did. Very soon after that somebody said, “Can you get me an Assam tea?” And I thought, “OK, if you can import Darjeeling, you can import Assam, and if you can important Assam, why not Ceylon?” And that’s how my business grew. 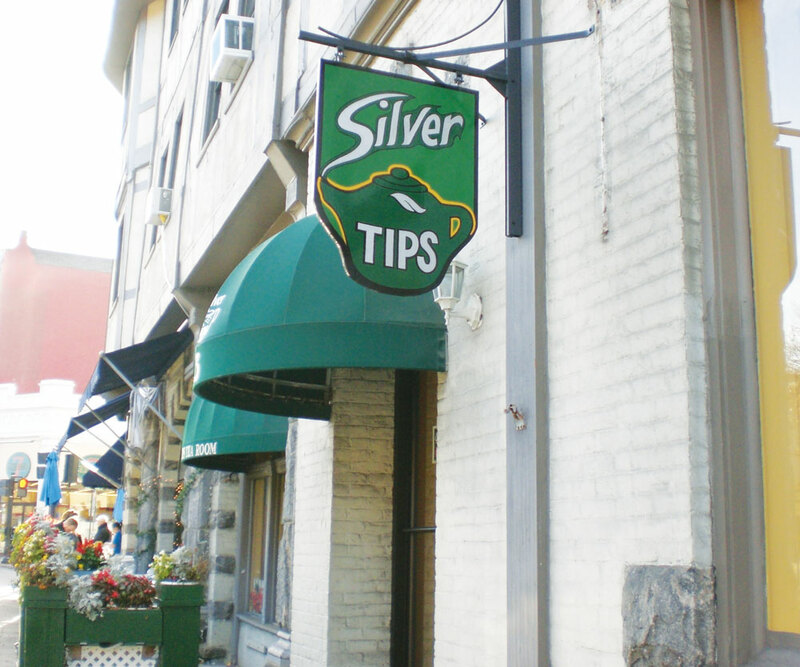 Mueller’s Silver Tips Tearoom in Tarrytown, New York. What made you want to move into retail and open Silver Tips in Tarrytown? Two or three years into my wholesale operation I came to the conclusion that I was not finding complete satisfaction in what I was doing because I had all this knowledge about tea, about how it is grown. I had stories. I had all this knowledge of the actual growth of tea and the beauty and history and romance of tea. But I was not able to really share that with the customer. So I decided I wanted to build a tearoom where I could have hands-on interactions with the consumer. And I was also going to use that as an incubator to find out what customers really wanted. Because I wanted to market how you could steep a perfect cup of tea, and the only way to share that was directly through tea tasting, education, instruction, labels, through talking to the customer, which I loved and I’m very good at. I was missing that, so in my fourth year, in 1999, I opened my tearoom. I bought the shop next door in 2009 and expanded from a small tearoom to a thirty-eight-seat tearoom. Today we barely have to explain what green tea is or what white tea is or what oolong is, what rooibos is. In our early days we had to explain that chamomile and peppermint were not teas. We don’t have to do that any longer. How do you educate customers on different teas? We taught all our staff right from the beginning, do not look down or have contempt for anybody. If they come in and say, ”You will hate me, I only drink teabags,” that’s fine. Use that as a training tool, and we’ll move that person who has regular teabags to English breakfast, then to single-estate Assams or Yunnans, then to a premiere single-estate of one of those. If they really only like tea with milk, I’m OK with that. We decided early on that we are not self-appointed gatekeepers. We believe in the democratization of tea. Any tea, and all tea, as long as you enjoy it, if you want to make it a certain way that’s fine by us. We want to get people up the ladder of whatever category they enjoy into better teas, and to expand their category. How have you watched consumers become more excited or knowledgeable over the years? Today we barely have to explain what green tea is or what white tea is or what oolong is, what rooibos is. In our early days we had to explain that chamomile and peppermint were not teas. We don’t have to do that any longer. Now they come in and ask us because they’ve seen it at the mall, at Teavana, at Starbucks, and they’ve seen so many more brands at the grocery store. All we want to do is make that experience more hands-on, more affordable, more variety, and separate the myths from the reality. It is so refreshing to see that the sale of tea doesn’t start with, “I don’t drink tea,” or, ”My grandmother used to give it to me when I was ill.” We are beyond that. Have there been any downsides to the growth of tea? Our administrative and regulatory burdens have increased more than we ever thought possible. So many companies now are dealing with tea but they don’t seem to understand that tea has less of a risk from a food perspective than, let’s say, herbs and spices, and the entire burden of regulatory requirements have now been appointed to tea willy-nilly. So we spend a huge amount of time now filling out forms and doing food safety questionnaires and allergens and nutritional value and letters of guarantee and letters of conformity and all of this, most of which is not even applicable to tea. We’ve lost that battle. What future goals do you have for your companies? I definitely want to do a lot more education than I have done. I think we have unlimited potential in taking tea on the road, to be able to do more tastings, more lectures, more educational basics. There is still a thirst out there that I don’t believe is being met, not just with my own customers. Obviously we want to keep expanding, but the part that I think we have not done as well as we would like is to spread the word on tea to the average consumer or even my wholesale customers. My big focus is bringing back information from origin. But a mission that we’ve started is really trying to get that word out in an educational, fun, interesting, and readable way across as many platforms as we can. So we have a thriving Pinterest board, we are active, and I mean active. The last blog post we wrote wasn’t three months ago; the last blog post was yesterday. We post on Facebook every day, so we have a very active engagement now across our social media platforms and we spend real time and energy in taking that message and trying to spread it in a cohesive way so that it makes sense, and so that our brand doesn’t get diluted. It really gets enhanced in a planned way. What have been some personally life-changing teas for you? Milk oolong. There is nothing like it. The oolong category continues to surprise me. When we first started it was jade oolong. In recent years it is milk oolong. We find that greens and premiere Yunnans and Assams have complexities that are just mind-blowing if you try them. All black teas are not alike. There is huge complexity with chocolaty notes in some of these Yunnans and the real, real malty notes in some of the higher grade Assams. And unquestionably, our own garden, Makaibari, produces a quality of silver tips that has actual taste and floral notes and complex notes. I learned to view teas very differently when I started steeping these teas and I started cupping and really appreciating the different nuances of very high-end teas.